Recipe by Jennifer Murphy Gillespie - A delicious dessert for Fall and Winter. 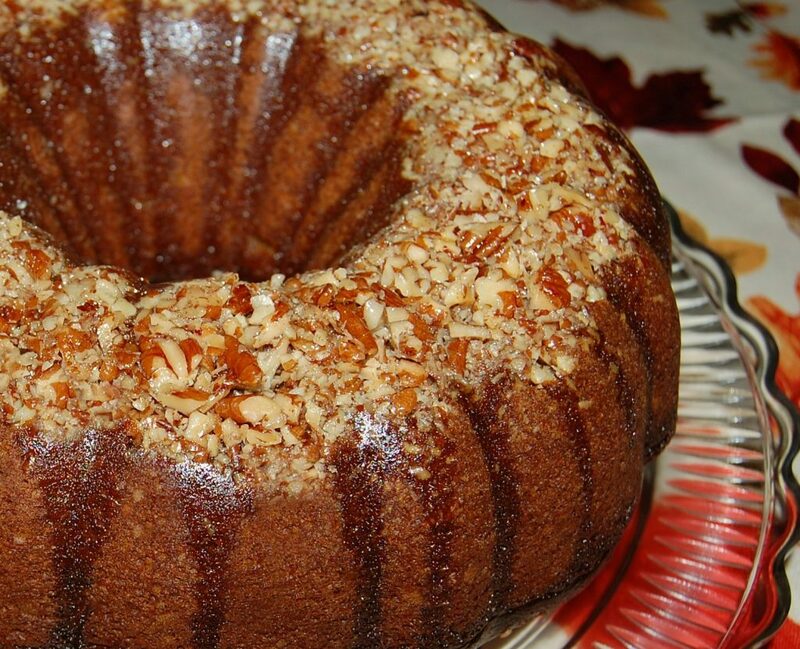 Moist pumpkin cake, topped with a rum butter glaze and chopped pecans...YUM!! Preheat oven to 325 degrees. Grease a 12-cup Bundt pan. Sprinkle chopped nuts over the bottom. CAKE: Combine flour, pumpkin pie spice, baking soda and salt in medium bowl; set aside. Beat butter, brown sugar and 1 cup granulated sugar in large mixing bowl until light and fluffy. Add eggs; beat well. Add pumpkin and vanilla extract; beat well. Add flour mixture to pumpkin mixture, 1/3 at a time, mixing well after each addition. Spoon batter into prepared pan. Bake for 60 to 70 minutes or until wooden pick inserted in cake comes out clean. Cool 10 minutes. Make holes in cake with long pick; pour half of glaze over cake. Let stand 5 minutes and invert onto plate. Make holes in top of cake; pour remaining glaze over cake. Cool. Garnish as desired. RUM BUTTER GLAZE: Melt butter in small saucepan; stir in 1/2 cup granulated sugar and water. Bring to a boil. Remove from heat; stir in rum or rum extract.